A blog for remembering abandoned railroad lines, historic highways, ghost towns and forgotten places. Most of the abandoned railroad corridors in the United States have been abandoned post-1970, as federal regulators became more lenient in allowing under performing lines to be abandoned, or railbanked. Spikes in abandoned railroad lines also occurred around 1916 and 1940, both of which involved tearing of rails for steel to aid in the effort of both World Wars. But indeed, railroad abandonment is an ongoing process, and has been since nearly the beginning of the history of railroads in the US. With that in mind, I wanted to discuss some of the earliest abandoned railroad lines, abandoned before the turn of the 20th century, which died before no one reading this would ever remember seeing. The story of the Iron Range & Huron Bay Railroad could easily take up an entire blog post. 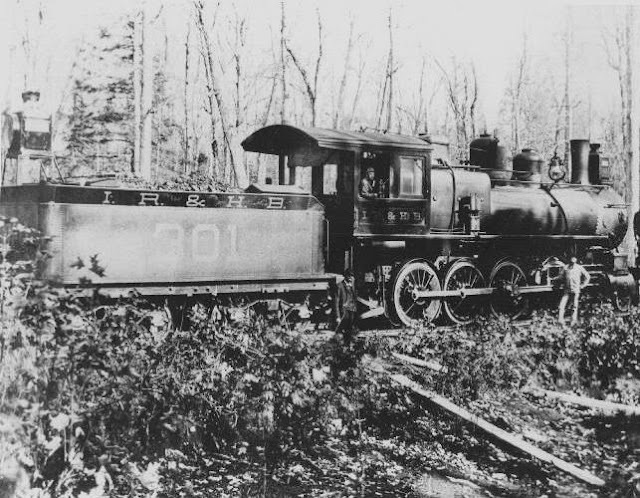 It was one of dozens of railroads constructed in Michigan's Upper Peninsula to tap into the rich iron ore deposits discovered in the 19th century. The company formed in 1890 to construct a line from Champion, MI to a new Lake Superior dock (near Huron Bay). The route chosen proved treacherous and hilly. The initial 500 man workforce tripled in 1891, and grading would not be finished until the year afterward. Cost overruns coincided with the Panic of 1893, which caused ore prices to plummet. 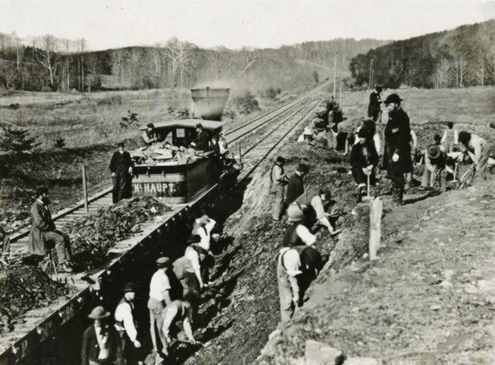 Although rails would be laid around the route, facing $2 million in construction costs and an inability to recover operating costs through ore sales, this railroad became an extremely unusual example of a line which was fully completed, but never had a revenue train run on it. The company was sold for pennies on the dollar to Detroit Construction Company, and the rails were reused in some interurban railways in the Lower Peninsula of Michigan. 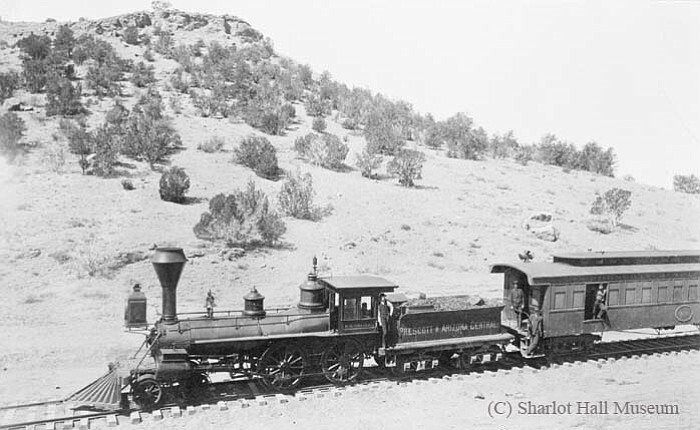 The Prescott & Arizona Central Railroad connected Prescott with Seligman, AZ and the Atlantic & Pacific Railroad (later becoming the Atchison Topeka & Santa Fe). According to Andy Odell, the line was built in 1886 and went out of business in 1893, being formally abandoned two years later. Odell's trace of the right of way is viewable on my abandoned railroad corridors map. While many railroads in arid climates leave obvious traces of their right of way long after abandonment, the poor, unballasted construction of the P&AC makes it that much more difficult to observe from satellite imagery. As I understand it, his trace uses both field observations and satellite imagery. Like many of the failed railroads of the late 19th and early 20th centuries, the P&A failed as a result of its poor construction, bad management, poor service, and high freight costs. Transportation in the early 18th century was dominated by canals, and the development of railroads in the coming decades was a major disruption to that industry. Canals and railroads competed against one another for freight, and railroads were not always successful despite being the superior technology at the time. Such was the case of the New Castle & Frenchtown Turnpike and Railroad Company, which opened in 1831. This made it one of the first railroads in the United States (and the first in the State of Delaware), running between New Castle, DE and Frenchtown Wharf, MD, which is now a ghost town. 1976 Map of the former NC&F RR ROW. Image: Wikipedia Commons. The history of the route was quite intertwined with canals, as the completion of the Chesapeake & Delaware Canal to the south left New Castle on a virtual transportation island. Originally conceived as simply a turnpike (toll road), in 1831 the company was rechartered as a railroad. The first year, the company relied on horsepower, but in 1832 the Iron Horse made its debut to the route. Competition from the Canal would result in the line being abandoned somewhat west of Bear, DE, all the way to Frenchtown, MD, or roughly half of the 15 mile route in 1859. One of the earliest US railroads would also face one of the earliest abandonments in US History. East of Porter Rd, however, the line would be purchased by the Philadelphia, Wilmington & Baltimore Railroad, and is still in service today after changing flags from the PW&B to the Pennsylvania Railroad, Penn Central, Conrail, and finally Norfolk Southern. The relationship between the canal industry and the railroad industry would be further intertwined in what would become the first example of a railroad replacing canals in the United States, with the Leiper Railroad in 1810, which predated steam engines by about two decades. 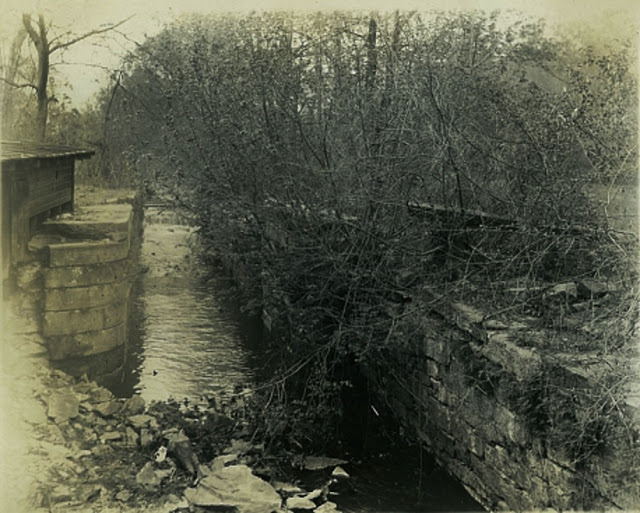 Thomas Leiper originally envisioned creating a canal between his family owned quarry and Crum Creek in Delaware County, PA, just outside Philadelphia. Another nearby quarry owner objected, stating the canal would interfere with his power generation, and Leiper's Canal was rejected. 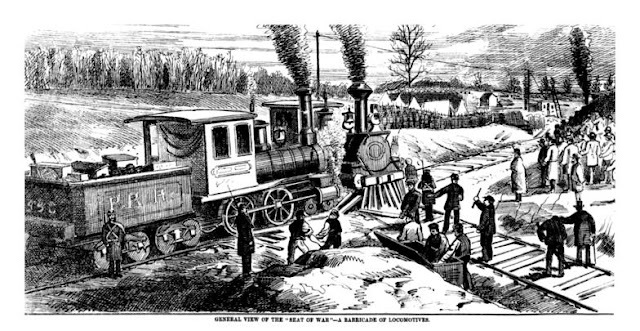 Undeterred, Leiper instead applied for a railroad charter, and was granted such, in 1810, creating a horse-drawn railway with wooden rails at the location where the Leiper Canal was intended to go. The first iteration of the Leiper in 1810 was an experimental operation not 60 yards in length, demonstrating the possibilities that railroads could have for transportation. Another unrelated Experimental Railroad was constructed in Raliegh, NC in the early 1830's. Once full-on operations began, it operated as the first non-temporary railroad in the United States. In 1824, the railroad was abandoned and replaced with the canal that Leiper had been seeking since the beginning. Image of the very narrow Leiper Canal. Image: Delaware County Historical Society. 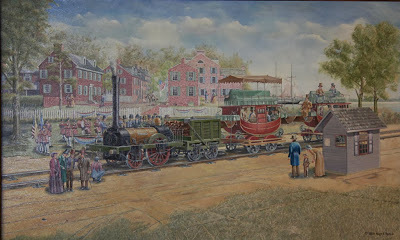 In an illustration that railroad abandonments are not necessarily a linear phenomenon, the canal which replaced the railroad was ultimately replaced by another railroad in 1852 constructed by the Baltimore & Philadelphia Railroad (which became part of the B&O). That railroad was abandoned sometime in the 1930's, but you'd never know there was a railroad (or canal) there today, as the ROW has been built over by housing subdivisions. By the 1870's, railroad companies were large enough that competition for routes, freight, and labor began to reach a boiling point. This manifested itself in some interesting ways, and in extreme cases, even resulted in wars between railroads. In the same vein, the Pennsylvania Railroad actually constructed a railroad for the sole purpose of blocking one of their competitors from completing a route from Philadelphia to New York. The Mercer & Somerset Railway ran between Somerset Jct., and Millstone, NJ, with a route that ran through Hopewell, NJ, where the Delaware and Bound Brook Railroad (part of the National Railway) was intending to build as part of the Philadelphia-New York Route. Chartered in 1870, this culminated in a Frog War in 1876, where the Pennsylvania Railroad parked one of their largest locomotives right where the line was to cross the M&S, preventing further completion of the route. Tensions between workers of both companies nearly reached a heated war, but ultimately courts ruled against the Pennsylvania Railroad, who was forced to move their locomotive and not interfere further with construction. Having served its purpose, the Pennsylvania Railroad abandoned the right-of-way four years later in 1880. The Golden Spike ceremony is celebrating its 150th Anniversary in May of this year, and as such, I plan to do a full and complete blog on the Transcontinental at that time, so I'll keep this one relatively short. The Union Pacific and Central Pacific were both under government contracts to complete the grade, Union Pacific from the east and Central Pacific from the west. 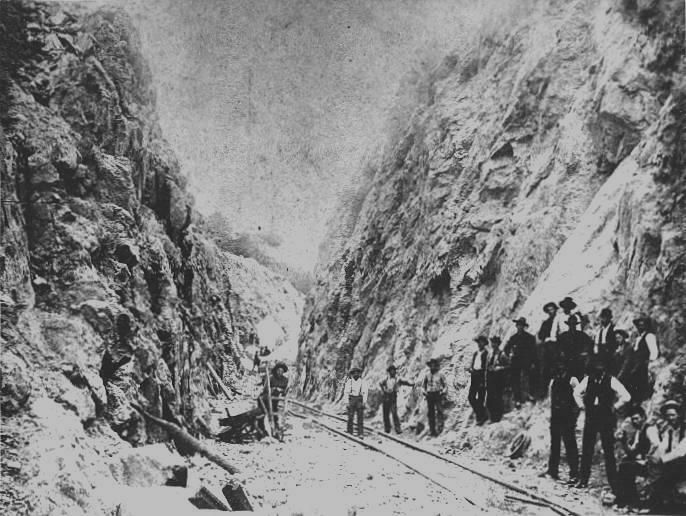 The two companies passed each other near Promontory, but both continued to work, resulting in two grades, one built by CP and a shorter one built by UP, as both companies were paid by the mile for the work. The Union Pacific grade was considered obsolete, and as such was abandoned less than a year later in 1870. The Central Pacific grade would be supplanted by the Lucin Cutoff in 1904, but remained in service until it too was abandoned by the Southern Pacific in 1942 to support the war effort. As always, I hope you enjoyed this blog, and let me know of any other very early abandonments you've come across in the comments, thanks for reading! Just correcting what I'm sure is a typo, but the Iron Range & Huron Bay ran to Huron Bay, on Lake Superior. Thanks for the comment. Indeed it was a typo and has been corrected. Most of the unfinished railroads listed at http://russnelson.com/unfinished-railroads.html were abandoned in the 1800's. Thanks for your list! It has been a big help. This site has affiliate agreements with certain websites. When you click on links to various merchants on this site and make a purchase, this can result in this site earning a commission. Andrew Grigg 2018-2019. Simple theme. Powered by Blogger.